A couple weeks ago I wrote about our traditional family feast, a time when we all meet at my mother’s house in the countryside to celebrate carnival. It’s always silly, loud and involves lots of good food. The festive highlight is the making of our “Berliners” which involves each family member. A “Berliner” is a sweet speciality which looks a bit like a doughnut without a hole. It’s made of yeast dough, filled with jam, deep fried in vegetable shortening and sprinkled with cinnamon icing sugar. The jam filling changes with the years, a few weeks ago I filled mine with blueberry jam which became my favourite (for now), they tasted divine! The reason I made them at my home without my family before carnival, was a blog tour I was asked to joined. I decided to share our “Berliner” family tradition. I made them on my own for the first time in my life, they were as good as at my mother’s but it’s more fun with family and friends. In the end it turned out to be (subconsciously) a wise choice as this carnival will be different. This year there is neither a family feast nor a “Berliner” to enjoy, for us it’s soup instead. A wisdom tooth got in our way and needed to come out quick. Needless to say, a jam filled Berliner isn’t the appropriate food in a situation like this, porridge and soup is more like it! I have a big, beautiful cauliflower in the kitchen, a cabbage I don’t use so often but in a velvety soup it shows its finer qualities. The sweet taste and smooth texture is great for puréed soups. I don’t add any cream, just broth, onion, garlic and some tangy flavours, lemon and ginger. 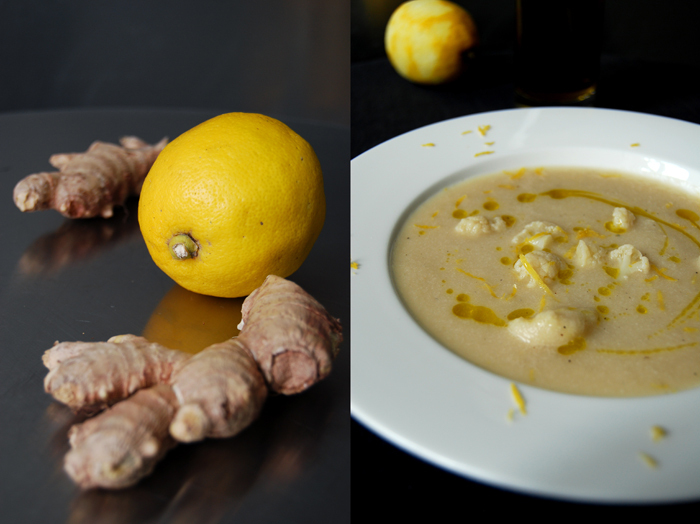 A piece of ginger simmers together with the cauliflower in the broth before I season it with grated ginger to taste. I add the lemon’s juice and zest when the soup is done, arrange it in plates drizzled with some good olive oil and sprinkle some more lemon zest on top. I’m impressed, it’s still smooth but fresh! 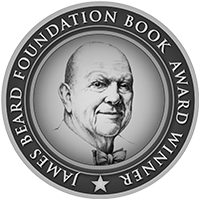 Last week I told you that eat in my kitchen was nominated for The Kitchn’s Best Daily Read Cooking Blog Award 2014. 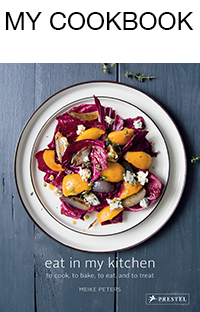 Food52 won the award but I want to thank you all for your support and all your votes, with your help eat in my kitchen reached the final! In a large pot, fry the onion and garlic in a little oil until golden and soft. Add the cauliflower, bay leaf, the piece of ginger and broth and bring to the boil. Cook for 10 minutes or until the cauliflower is al dente. When it’s done take out the bay leaf and ginger and put a few smaller pieces of cauliflower (a small plate full) aside before you mix the soup in a blender. 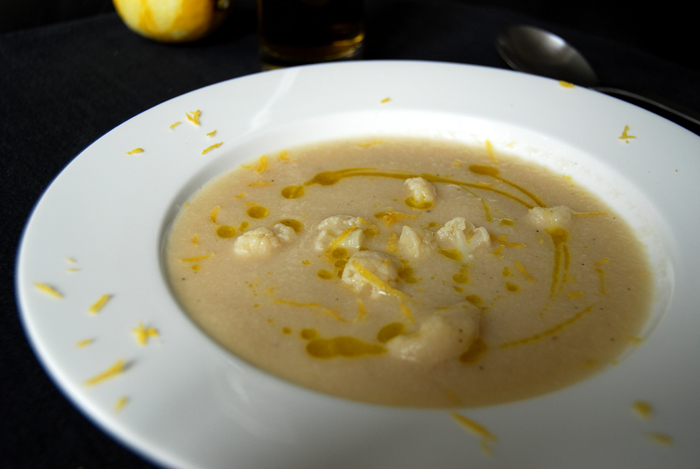 Season with salt, pepper, the grated ginger, lemon juice and zest and put the cauliflower pieces back into the smooth soup. When you arrange the plates, drizzle some good olive oil on top and sprinkle with some lemon zest. Thank you Gina! 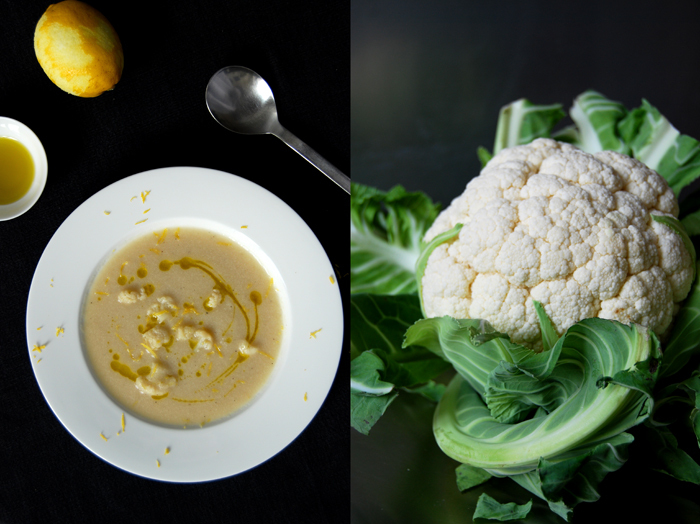 We were really impressed how good the cauliflower tastes together with the ginger and lemon, and it’s a quick too!